Damn beat me to it, heat added! ordered using the Voucher discount i get for John lewis of 5%Making it …ordered using the Voucher discount i get for John lewis of 5%Making it £285 for me Value£300.00You Save£15.00You Pay£285.00Total Savings£15.00Total to Pay£285.00heat added.Monday morning started expensive ! I get it as part of work benifits with different retailers. So you buy via that and you get discount. Anyone with suggestions about accessories ? Great price. Thanks OP - ordered. This is cheaper than with student discount via GoPro’s own site. Had a few gift vouchers knocking about too. Looks like amazon is down to £299 as well but 5% discount additional & 2 …Looks like amazon is down to £299 as well but 5% discount additional & 2 year warranty sealed it for me with JLAnyone with suggestions about accessories ? Not for me - still showing as £329 on Amazon. For accessories the third party packs are much cheaper and do the job fine, depends on what activities you will be using for but something like this one for £10.99 covers most situations (head, chest, bike/pole, car, float grip, tripod & selfie stick). yes their algos prob noticed few ordered and ramped the price up again..
Go Via the John Lewis side its cheaper. I can sort out the 5% vouchers for anyone if anyone is willing to take the risk of "trust"
How do you mean? I’m intrigued.....! Amazon has clever algorithms which are programmed. when they see the Bids (Lots of people buying) and they see stock reducing the Price goes higher when certain stock thresholds are triggered. 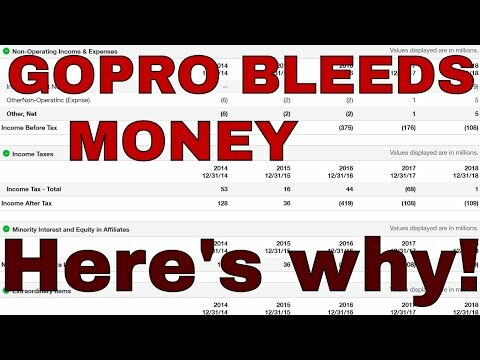 Its the same technique which is used in trading.its called "lowballing"
I’m all in for a risk of “trust” - how can you help me with a 5% voucher? :/ trekking a volcano in Bali in May - a GoPro black would be awesome! I dont think its that bad going by the reviews that i have seen. I got caught out once though because they aren't refundable for cash. I bought £150 worth of argos vouchers intending to buy a baby crib, then the next day amazon dropped their price for the crib to £120. I bought from amazon for the cheaper price but I was then stuck with loads of argos vouchers which I didn't need. Eventually got them used up! Agreed, if you’re buying a GoPro for good audio quality then you’re definitely looking at the wrong camera. I’ve got a Hero 5 Black and shot an absolutely lovely holiday video and just replaced audio in post. Great price. Thanks OP - ordered. This is cheaper than with student …Great price. Thanks OP - ordered. This is cheaper than with student discount via GoPro’s own site. Had a few gift vouchers knocking about too. I've been looking at getting this via the gopro site using student discount and for me it works out cheaper there (£329 minus 20% discount = £263.99). This is good if you don't have access to student discount though. It cannot be fixed, they do it by cropping the sensor, every phone camera does the same. It cannot be fixed, they do it by cropping the sensor, every phone camera …It cannot be fixed, they do it by cropping the sensor, every phone camera does the same. I have the Hero7 black and I think stabilisation is impressive. Filmed during the weekend riding my bike on quite rough tow paths and result is very good. I have access to a similar scheme, it can be pretty good I got caught …I have access to a similar scheme, it can be pretty good I got caught out once though because they aren't refundable for cash. I bought £150 worth of argos vouchers intending to buy a baby crib, then the next day amazon dropped their price for the crib to £120. I bought from amazon for the cheaper price but I was then stuck with loads of argos vouchers which I didn't need. Eventually got them used up! Damn. 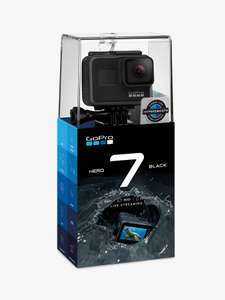 It was £379.99 yesterday via the GoPro site. With the drop to £329 it is cheaper with student discount. Damn. 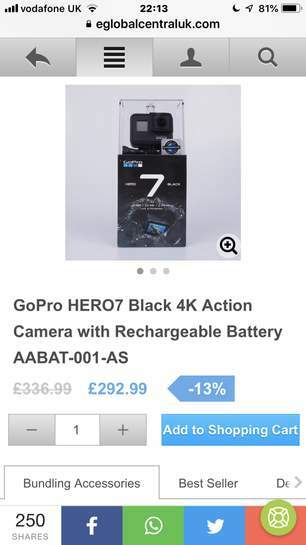 It was £379.99 yesterday via the GoPro site. With the drop to £329 i …Damn. It was £379.99 yesterday via the GoPro site. With the drop to £329 it is cheaper with student discount. Actually, on the GoPro site it reverts back to £379 when you enter the 20% off student code ie £303.99. Cheaper via JL. Oh no..bad timing, maybe you could cancel and order via the cheaper option? Actually, on the GoPro site it reverts back to £379 when you enter the 20% …Actually, on the GoPro site it reverts back to £379 when you enter the 20% off student code ie £303.99. Cheaper via JL. Ah I see that's sneaky! Not correct. You can record "hypersmooth" stabilised footage at 4k, 60 frames per second. Works brilliantly, and if like me you ordered it earlier in the year from JL and email them, they will refund the difference. Not correct. You can record "hypersmooth" stabilised footage at 4k, 60 …Not correct. You can record "hypersmooth" stabilised footage at 4k, 60 frames per second. This is one of the reasons I’ve ordered one. All the reviews say stabilisation all the way up to 4K 60 frames a second. what are the accessories people recommend ?